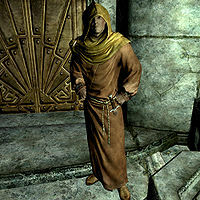 Brother Verulus is an Imperial priest residing in the Hall of the Dead in Markarth. He can initially be found outside of the hall in Understone Keep, having an argument with Thongvor Silver-Blood. He wears a set of hooded monk robes along with a pair of boots. He carries the key to the Hall of the Dead along with a selection of common loot and gold. In combat, he relies on an iron dagger or a staff of frostbite. Being a priest he knows a decent set of spells. From the school of Alteration, he knows Oakflesh and Stoneflesh. From the school of Destruction, he knows Lightning Bolt and Sparks. From the school of Restoration, he knows Healing, Grand Healing, Lesser Ward, Turn Undead, Fast Healing, and Turn Lesser Undead. He starts his day in the Understone Keep at 8am, and will wander around the Keep for the entire day, eating at noon and at 6pm, before going to sleep at midnight. Thongvor: "What are you hiding, priest?" Verulus: "I'm not hiding anything. It's closed for a reason." Thongvor: "Typical Imperial lies. First you take away Talos, now you're keeping us from seeing our honored dead? You and the Jarl will answer for any desecration of my ancestors' bodies." Verulus: "That's enough, Thongvor. We're done." Upon first speaking with him, you can ask him about the Hall of the Dead, and he will answer: "New to Skyrim? I was confused at first, too. The Nords call their mausoleums the Hall of the Dead. It's where people in the city are buried. Fathers. Forefathers. Mothers. Foremothers." You can also ask him who Arkay is, and he will say: "Arkay. One of the Eight Divines. God of the Cycle of Birth and Death. It is his shrine people pray to when they visit the Hall. That his divinity will watch over their ancestors on the way to the next life." I could help if you tell me. (Persuade) Passed: "All right. I was going to suggest the Jarl hire someone to sort this mess out, anyway." Would some coin help? (Bribe) Passed: "Well, the Priesthood of Arkay always accepts generous donations." Failed: "That's not going to work." I don't like being ignored. (Intimidate) Failed: "Then my answer is the Hall of the Dead is closed. By order of the Jarl. Understand?" I'll come back later, then. "Arkay keep you and protect you." Succeeding in convincing him to tell you will trigger the quest The Taste of Death. He will explain further what is going on: "We've discovered that some of the dead have been... eaten. Flesh has been chewed off, bones were snapped to get at the marrow inside. We haven't caught anyone or anything yet. It's like it knows when I'm there. If you can get to the bottom of this, the Priesthood of Arkay will reward you. Take my key, and be careful." Once you have returned to him, tasked from Eola to lure him into her trap, he will anxiously say: "You've returned. What happened in the Hall of the Dead?" If you decided to kill Eola before luring Brother Verulus out of Markarth, you can tell him either simply that the Hall of the Dead is safe now, to which he will say: "Divines preserve you, you're a hero. We'll re-open the Hall right away." or, you can tell him that the cannibal has been taken care of, and he will say: "I don't need to know the details. Blessings of Arkay to you for your help. Here. Take my amulet as a reward." There would be treasure to share... (Persuade) Passed: "Treasure, you say? I suppose the Jarl won't mind if I'm gone for a little while. Lead on. Failed: You know, in the Priesthood of Arkay, we have a joke about an empty pocket being better than a full grave." I'm willing to pay. (Bribe) Passed: "That's no small amount of coin, friend. I suppose I can come with you for a short venture. Lead on. Failed: I'm just not up for it, sorry. I'd rather stay here, have a glass of wine, and perform my rites to Arkay in peace." You're coming with me. Now. (Intimidate) Failed: "I think you need to calm down before I summon the guards." Never mind, then. "Arkay watch over you." While following you during the quest, he may occasionally say "Don't worry, Arkay's protection is absolute." as well as: "Don't worry, the Eight are watching over us. I hope." If you make Brother Verulus sleep, and then decide to kill everyone in the room, he will wake up and be in a daze, saying: "What... what happened?" you can either avoid telling him the truth, and he will say "Thank you. I don't know what's going on, but I think I owe you my life." or, telling him the truth, he will say: "Sweet Breath of Arkay, were these the cannibals that were plaguing the Hall of the Dead?" Regardless of your choice, he will then say "I need to get back to Markarth. Here, take this. It's the least I can do for saving my life." or, simply: "I must return to Markarth." If you see him later after the quest, he will occasionally say: "Thanks again for saving my life. I think I'm done with venturing outside of Markarth, though." While on the quest The Taste of Death, and having asked him to accompany you to Reachcliff Cave, Brother Verulus will follow you everywhere until he is brought to Eola. Thus, he may be used as a powerful follower in addition to any follower you may already have if you postpone returning to Reachcliff Cave. Brother Verulus has multiple empty coffins inside the Hall of the Dead with his name on them, even while he's alive. 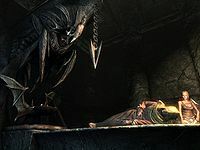 If you kill Eola in the Hall of the Dead and report back to Verulus, he will approach and speak to you every time you are near him at Understone Keep. This page was last modified on 22 December 2014, at 01:59.